Joel earned his Bachelor of Science degree at the University of Wyoming in 1994. He served honorably as a Captain in the Wyoming Air National Guard serving as an Operations Officer for the 187th Aeromedical Evacuation Squadron. He started his career with CEESI in 1996 as a flow measurement technician performing both secondary and primary calibrations; during that time he worked in the Primary A, Primary B, and Missile Bay test areas. He has received training on multiple ultrasonic meters and is considered an expert on most. He assisted in the design and construction of the Iowa facility in 1999, as well as the low flow expansion in 2011. He oversees the daily operations at the Iowa facility and has trained much of the staff. He has been a central figure in planning and hosting the annual CEESI ultrasonic conferences, which began in 2000; he not only helps coordinate these conferences, but regularly presents papers and teaches training courses prior to each conference. 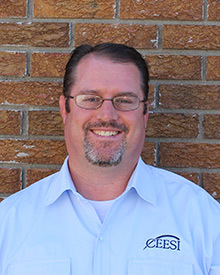 Joel's expertise in ultrasonic flowmeters has lead him to consulting projects and site audits around the world, including several regions around the U.S., as well as in Asia, South America, and Africa. This expertise is well recognized in the industry. He has worked with several industry schools including: International School of Hydrocarbon Measurement, Appalachian Gas Measurement Short Course, American School of Gas Measurement Technology (chairing several subcommittees). Joel also serves on the American Gas Association (Transmission Measurement Committee) assisting with past and present updates of AGA 9 . Joel is part of CEESI’s instructional staff for ultrasonic flow measurement courses. He also serves as an advisor for the company in the development of new calibration systems and laboratories; he has worked with several customers in various countries on lab design. For two weeks each year, he oversees research with the North American Fluid Flow Measurement Council at the Iowa facility for various research projects. He has worked with customers performing station audits and LAUF (Lost And Unaccounted For) investigations, primarily working with ultrasonic meters. In 2016, Joel was promoted from Vice President to President CEESIowa.